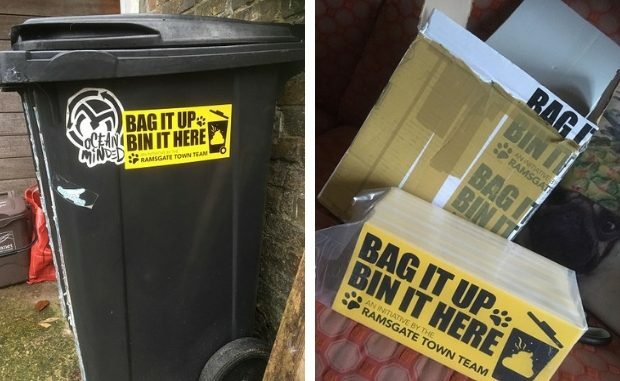 Ramsgate Town Team has launched a bin sticker scheme in a bid to tackle the problem of dog mess left in the streets. The team are offering ‘poo stickers’ for businesses and residents to put on their bins if they are happy for them to be used by dog walkers to dispose of their pet’s waste. The idea is for those who are happy to let others use their bin, which needs to have mechanical collection and be near to a public footpath. Scheme member Maxine Morgan said: “I personally find more bagged dog poos discarded rather than dog poo on its own. Many people walk their dogs around the streets when, for whatever reason, they can’t take them to the park where there are plenty of bins. This is where we’re hoping the stickers will help by providing more bins that can be used. The initiative may now also be discussed with Margate and Broadstairs town teams to look at the possibility of rolling the scheme out across the isle. To take part in Ramsgate’s project people can pick up stickers from Custom House, Harbour Parade, between 10am and 4pm and also from 20 Military Road, again 10am – 4pm most days.